Who doesn’t love a hot muffin straight from the oven? Even better when they are made with love and real foods. They are perfect for lunchboxes, mum’s morning tea or just a sweet treat after dinner. Actually, some are cupcakes and some are muffins. I really don’t know what the difference is. 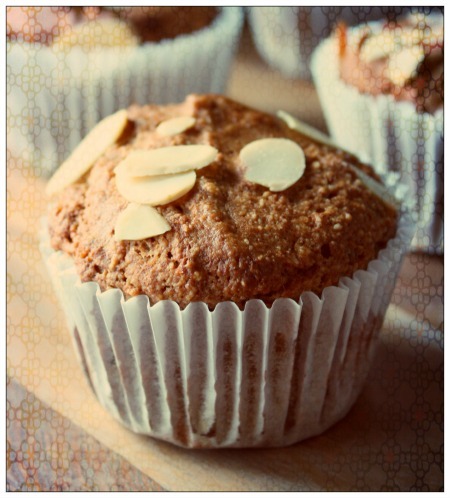 Maybe we feel more virtuous eating muffins rather than cupcakes?? Let’s go with that! These Chai Cupcakes from Katrina at Farmer K’s Kitchen are sublime. I could not stop eating them!! They are gluten-free, grain-free, sugar-free and dairy-free (I use coconut oil instead of butter). Kristin at Mamacino makes these Banana Maple Muffins that are verrrry tasty. They are grain-free, gluten-free, dairy-fre and sugar-free. 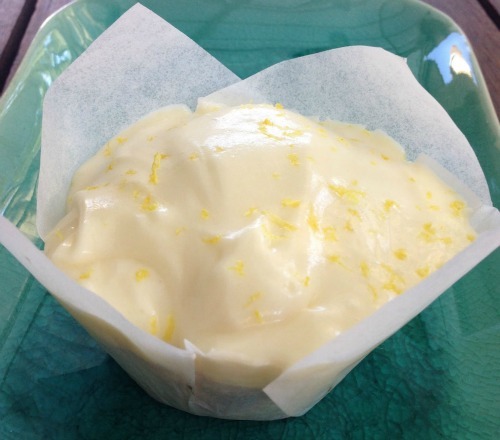 Alexx’s Coconut Cupcakes at Alexx Stuart are fast gaining legendary status around foodie circles. 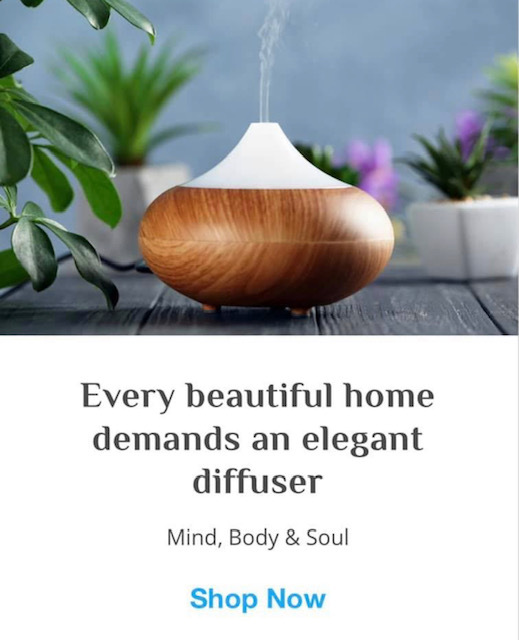 Check them out and see what you think! They are grain-free, gluten-free, dairy-free, sugar-free and nut-free. Date and Cinnamon Muffins from the beautiful Brenda at Brenda Janscheck Health and Lifestyle. They are wheat-free, nut-free, sugar-free and easy to make dairy-free (just use oil instead of butter). Jane from Marinya Cottage Kitchen has these delicious Little Hummingbird Cakes. They are grain-free, gluten-free, dairy-free, nut-free and sugar-free. 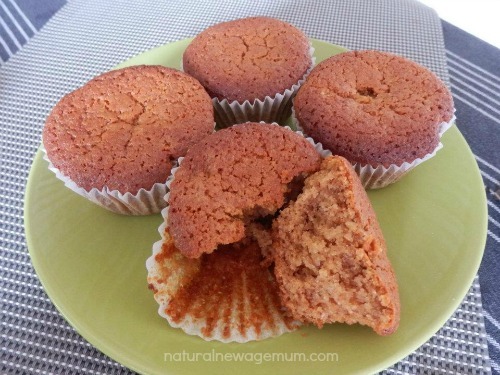 Iwa from Additive Free Bites says this is her most popular recipe! 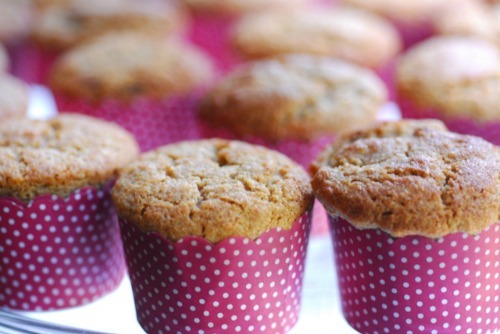 Lemon, Coconut and Chia Seed Muffins. Yum. They are wheat-free, nut-free and easy to make dairy free but using oil and a milk substitute. Blueberry Muffins (my favourite) from Tash at A Girl, A Guy, Fur Kids and Food. Tash is very clever and has given you options so you can make them egg-free, dairy-free, gluten-free, wheat-free and sugar-free. They are nut-free too! What about a raw muffin? Yes, there is such a thing. 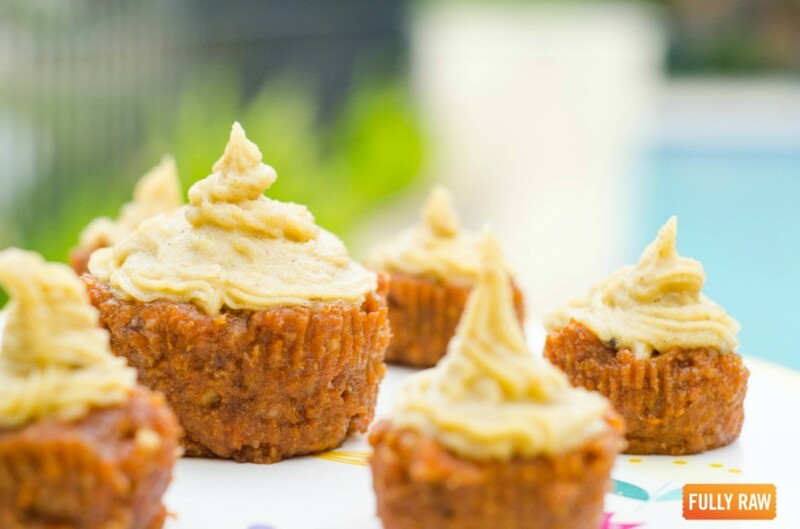 Check out these yummy raw Carrot Cupcakes with Orange Vanilla Frosting from Fully Raw via Rachel Campbell. They are vegan, egg-free, dairy-free, grain-free, gluten-free and sugar-free. 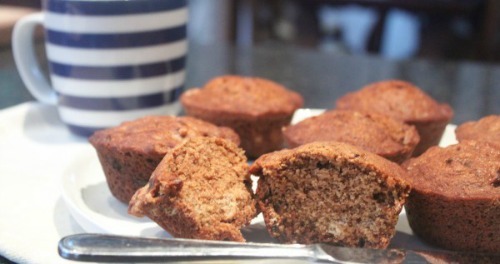 If you are not into sweets, a savoury muffin if delicious with soup. 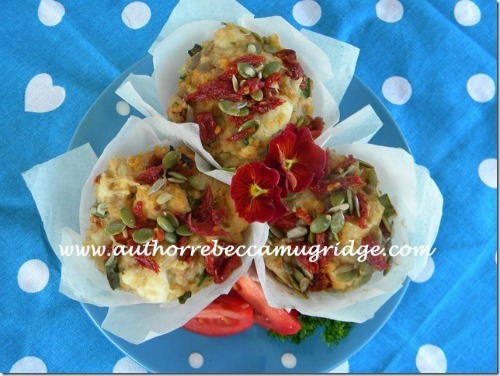 Beck at Author Rebecca Mugridge makes these fabulous Fetta and Sundried Tomato Muffins. They are vegetarian and nut-free. 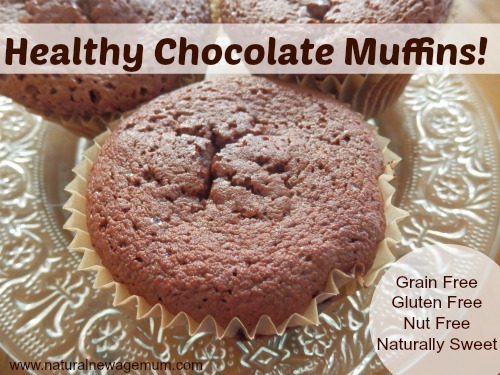 Healthy Chocolate Muffins from me! 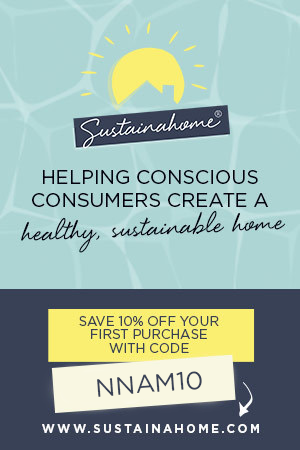 Grain free, gluten free, nut free, dairy free! 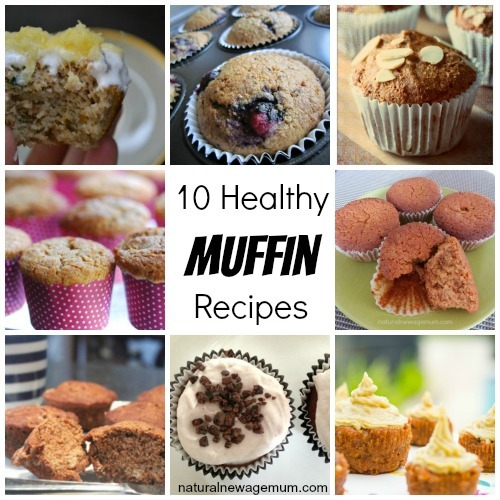 Do you have an awesome, healthy muffin recipe? Link us up! I would like to know how much coconut oil you use in the Chai cupcakes to replace the butter with. thanks for letting me share – I have a soft spot for dates … mmmm…. I feel a bit of muffin making coming on in the morning! These all look so good. I don’t know which one to start with! Wow thanks for sharing. 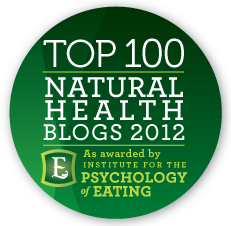 Such synchronicity as I have been looking for ways to reduce our grain intake lately! Just in time for back to school too. Ok, now to decide which to make first! Yum, love a good muffin! 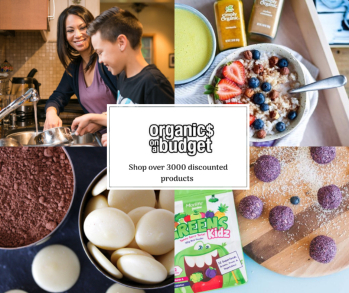 Ok, so I picked two from this list to make today with my children, and one of them is a big winner! The date and cinnamon ones – if you can pry yourself away from the batter and actually bake them, they are amazing! Yum…inspired me to bake today! 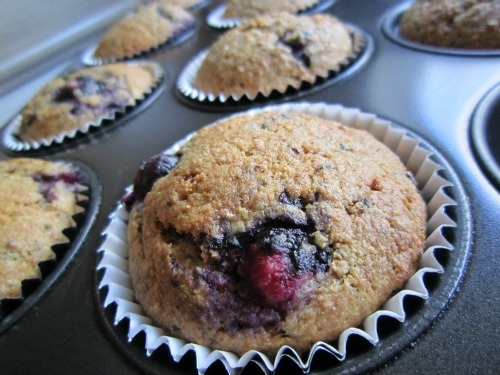 I made the Blueberry muffins, but used raspberries….delicious :-). Then made the Banana Maple muffins, so yummy! Banana maple muffins are going down a treat here. My daughtes actual comment was “yum yum delicious”. How fab do those raw ones look! Wow. Let me know what you think Astrid! 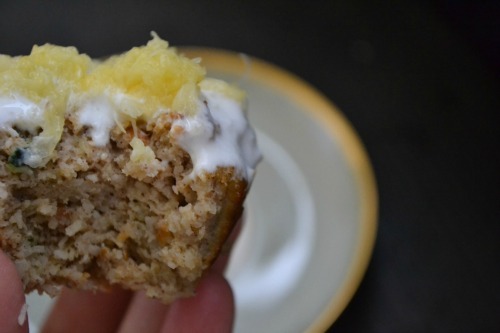 Made the coconut cupcakes today – OMG YUM!!! they are amazeballs aren’t they?? ?